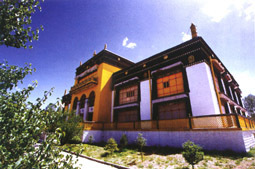 Shigatse, the Sakya Kloster (Sakya Monastery) is the principal monastery of the Sakyapa Sect of Tibetan Buddhism. Originally, the Sakya Kloster comprised both the Northern and Southern Monasteries. In 1073, Khon Konchog Gyalpo, the founder of Sakyapa Sect, built a white palace on a grey clay hill near the northern bank of the Chun Qu River. The locals named the palace 'Sakya' which means grey soil. This was the Northern Monastery but today it is visible only as a ruin. The Southern Monastery was built like a fortress and was surrounded by a moat. Construction of the monastery began in 1268 and was led by Benqen Sagya Sangbo under the commission of Choygal Phakpa, the fifth descendent of Sakyapa Sect. The walls of this monastery were painted in red, white and grey which indicate Manjusri Bodhisattva, Avalokiteshvara and Vajradhara. 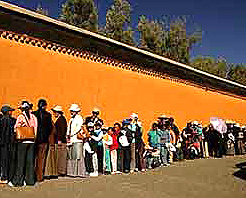 Dunhuang' due to its colossal collection of numerous Tibetan Buddhist scriptures, murals and Thangkas. According to statistics, about 40,000 volumes of scriptures are housed there. A wooden bookshelf which is about 57 meters (187 feet) long, 11 meters high (36 feet) and one meter wide (three feet) has 464 grids. More than ten thousand scriptures are housed on the shelf. Among them, the most precious is Burde Gyaimalung, which records Tibetan religion, history, philosophy, literature, agriculture and animal husbandry. It is 1.8 meters (six feet) long, 1.3 meters (four feet) wide and 0.67 meter (two feet) thick and boasts the biggest scriptures in the world. Additionally, it also houses 21 volumes of Buddhist scriptures written on Pattra leaves in Sanskrit. Each consists of one hundred to two hundred pages and four-color illustrations. They are the most precious sutras in the world. Sakya Kloster has many murals and 'Thangkas'. Most of the murals are from the Yuan Dynasty (1271-1368). Among them, the most outstanding and precious are the murals which depict portraits of the former Sakya ancestors, Phakpa's meeting with Kublai Khan (the founder of the Yuan Dynasty) and mandalas. There are over 3,000 'Thangkas'. The 360 from Song (960-1279), Yuan and Ming (1368-1644) Dynasties are the most precious. The Main Chanting Hall, also called Lakhang Chenmo in Tibetan, is a must-see for all visitors. Covering an area of about 5,800 square meters (1.4 acres), Lakhang Chenmo can hold about ten thousand monks chanting sutras together. In the hall are enshrined three Buddhas - Dipamkarara, Sakyamuni and Maitreya, and five Sakyapa ancestors. There are forty huge vermilion pillars supporting the ceiling, four of which are about one meter (three feet) in diameter. Each of the four pillars has its own story. Gyina Seqen Garna was bestowed by Kublai Khan. Chongbo Garwa, Dabo Garwa and Nabo Chaza Garwa were carried to the monastery by a wild yak, a tiger and the God of the Sea. In addition, on the second floor of the hall are 63 murals of mandalas, the best preserved in the monastery. Also in the monastery are some historical relics, such as seals, Buddhist figures, porcelain wares and embroidery from the Song and Yuan Dynasties. A black wooden casket which contains a white whelk clarion is the most precious. It was presented by Kublai Khan.